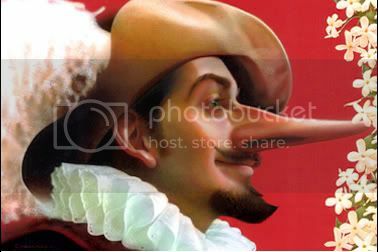 Here I am playing blog catch-up. It’s been a crazy bunch of days –- the stars aligned just so and there was an exhausting convergence of New York ComicCon and the Society of Illustrators’ annual gala. The weekend started with Richard Solomon’s annual cocktail party. This year it was held at the Beekman Towers with amazing views of east Manhattan. The party was great fun but as too many of us squeezed into an elevator to leave for dinner we managed to get stuck for a solid half hour. While it would be tough to call the experience fun it was a great crew to be stuck with. Luckily, only one person was truly claustrophobic, the rest of us were laughing for a half hour straight. The Elevator Club included Mark Summers, Gary Kelly, Greg Manchess, Peter de Seve, David Johnson, Barbara McClintock, Murray Kimber, Scott Brundage, Elise, Jim Bennet, and myself. The Society’s opening and awards ceremony. The show looks good although, typical of openings, I saw very little of it. The awards are always handled well. The director, Terry Brown, does a nice job of keeping them moving without feeling rushed. 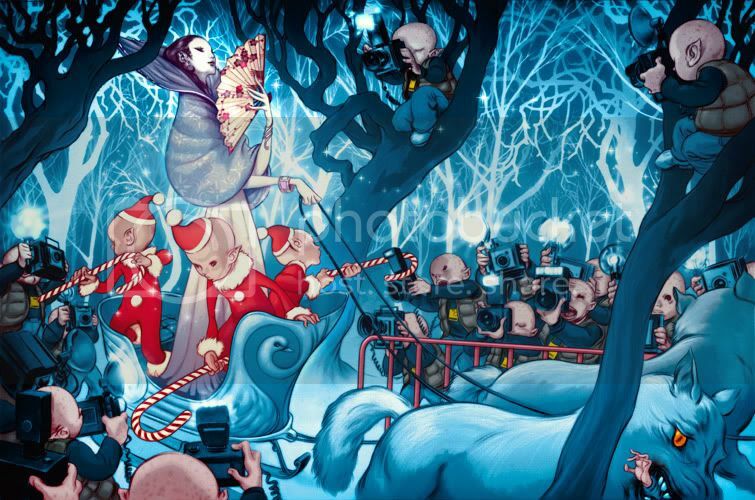 James Jean got a medal for one of his Fables covers. Gary Kelly got an medal for his brilliant Black Cat Bone book. (A perfect gift for anyone into the blues and Robert Johnson.) Greg Swearingen got a well earned award for the sweetest Cyrano you ever did see. I’m missing some other awards, but that's what I remember right now. It was great to see and talk to John Jude Palencar, Donato Giancola, Brad Holland, Steve Stroud, Michael Deas, and many others. There are a number of Tor covers in the show but, to be honest, I’m not even sure how many. I’ll get back and take some pictures of the exhibit soon. I was manning the Tor booth at ComicCon with our fabulous publicist Dot Lin. (Dot did all the work, hence, fabulous!) We had a well attended George R. R. Martin signing for Ice Dragon. Other authors and Tor alumni stopped by -- Timothy Zahn, David Keck, Greg Cox. I got to see some artist friends. The convention was much larger and more interesting than last year. Sadly, I missed seeing any panels since the rest of the weekend was completely booked up with activities. 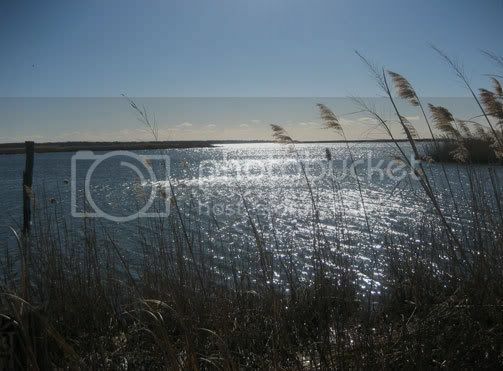 Hopefully next year I'll be able to spend more of the weekend there. Richard Solomon once again treated everyone to a lovely send-off breakfast, which was followed by a dinner with those still left in town. 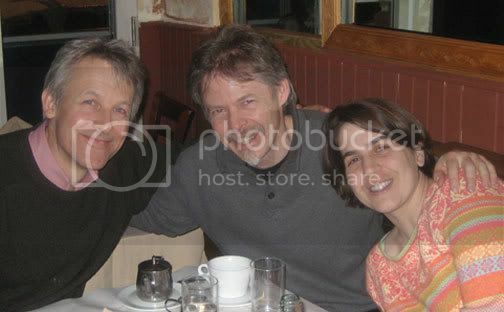 The whole thing was capped off by a small dinner with Paul Cox. Honestly, being at a table for just three at an intimate Italian restaurant was really a highlight --so nice to talk and actually be heard after so much partying. And somehow amongst all of this I managed to have a lovely lunch with my mom and my brother’s future in-laws. All in all -- a fun weekend but, boy, am I ready for nothing to do for a while. 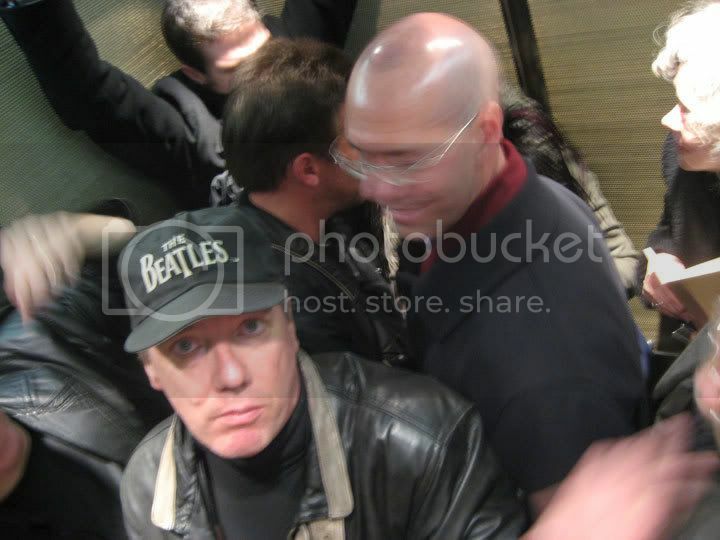 Stuck in the elevator -- Mark Summers, Murray Kimber, and others. 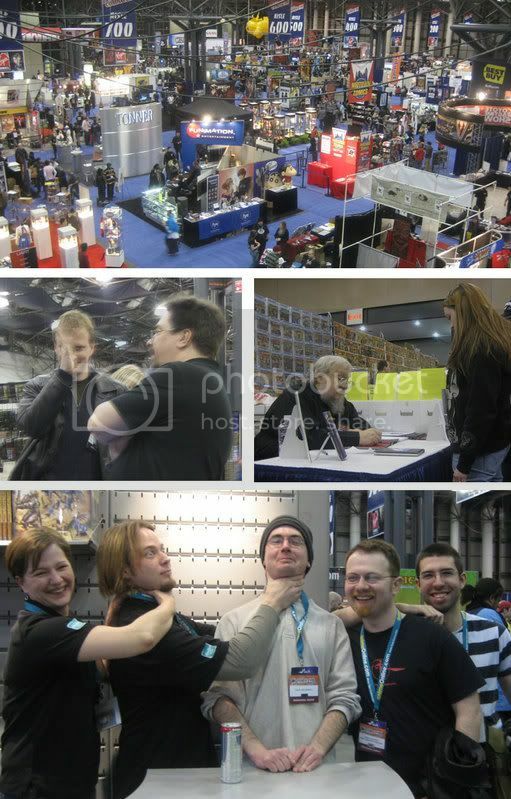 ComicCon floor; David Keck talking to Patrick Nielsen Hayden; George R. R. Martin and fan; Wizards of the Coast art directors, Mary (whose last name I have forgotten) and Jeremy Jarvis, with artists David Hollenbach, Arkady Roytman, and Dave Palumbo. Sterling Hundely’s award winning painting. Greg Swearingen gets a medal for Cyrano. 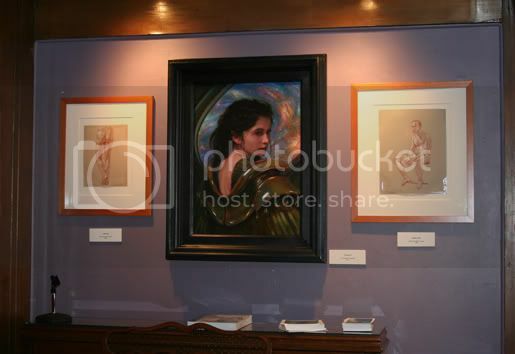 Paul Cox, Greg Manchess and me. 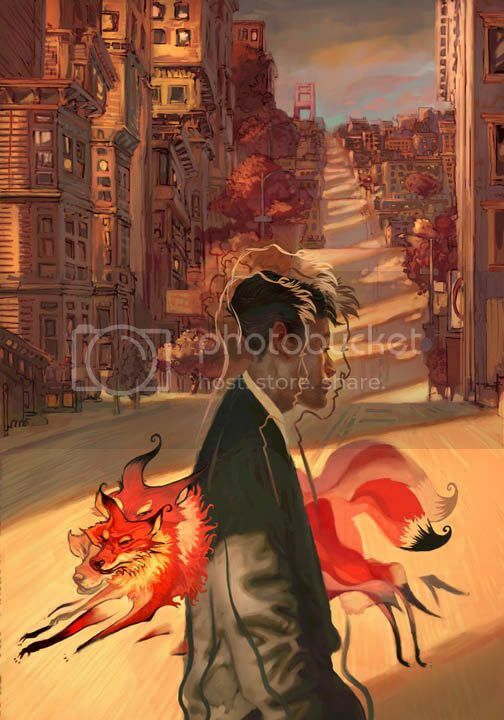 PICTURED: Jury, Daniel Dociu's Crescent City, James Jean's 1001 Nights of Snowfall, Jon Foster's 9 Tail Fox. 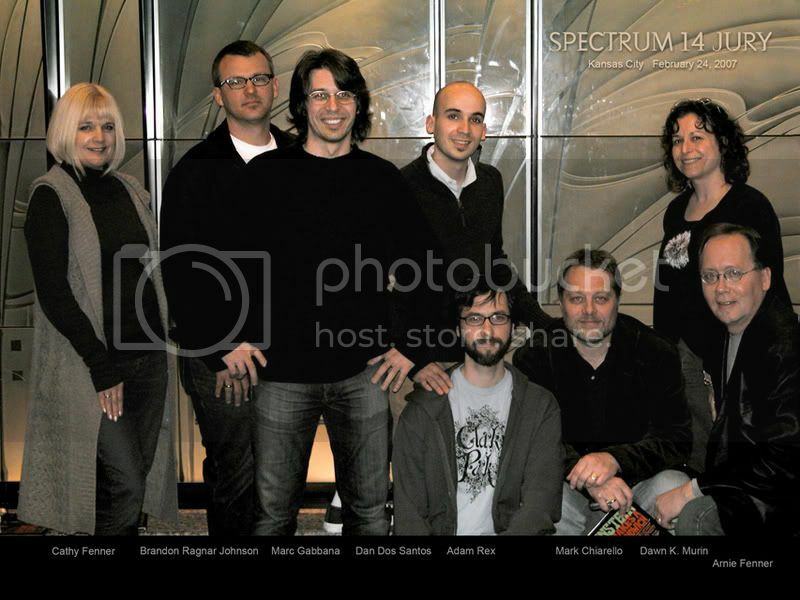 The jury for the fourteenth annual Spectrum competition convened in Kansas City, MO on the weekend February 23, 2007 to make their selections from over 5000 works of fantastic-themed art for this year's book. A new category— Concept Art— was added this year. The jury has given special recognition for superior achievement to the following artists in each of eight categories. The artists receive a Spectrum Award sculpted by Joseph DeVito which rests on a base sculpted by Tom Banwell with either a gold or silver engraved plate bearing the recipient’s name. The jury consisted of Mark Chiarello [artist/editor & art director for DC Comics], Dan dos Santos [artist], Marc Gabbana [artist/concept artist Ice Blink Studio], Brandon Ragnar Johnson [artist/concept artist], Dawn Murin [art director for Dungeons & Dragons/Wizards of the Coast], and Adam Rex [artist]. Art works created by jurors or created under their direction were excluded from consideration for awards. All of the art selected by the judges will be included in Spectrum 14: The Best in Contemporary Fantastic Art to be published by Underwood Books of Nevada City, CA in October, 2007. Spectrum is distributed to the trade by Perseus, Ingram, Baker & Taylor, and Diamond Comic Distributors. The series' editors are Cathy and Arnie Fenner. Please join us in applauding these exceptional talents! The Spectrum Grand Master Award is presented to a living artist for career excellence. The next Spectrum (#15) will open for entries in October 2007: information will be available through the mail and the official Spectrum website: http://www.spectrumfantasticart.com/. Spectrum: The Best In Contemporary Fantastic Art is acknowledged as the premiere showcase for imaginative illustration, sculpture, and Fine Art. Founded in 1993 by Cathy and Arnie Fenner, the Spectrum annuals are a who's-who of the best and brightest artists working today in all media. 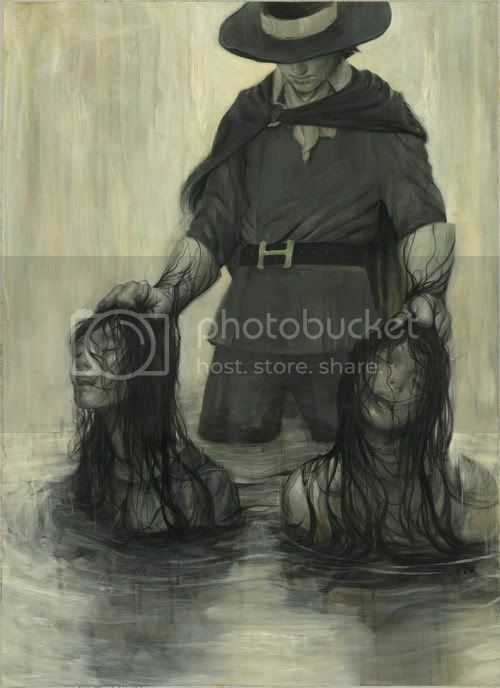 A retrospective show of selected art that appeared in the first eleven volumes of the series was held at the Museum of American Illustration in New York City in 2005. A second exhibition is planned for 2009. 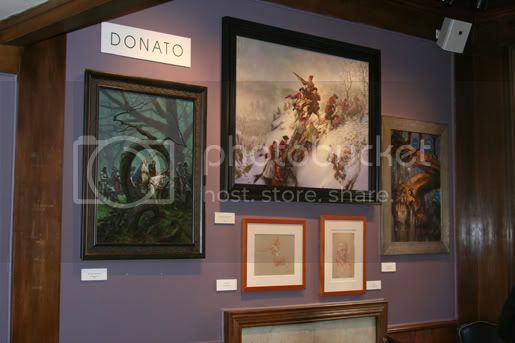 Donato Giancola has an exhibit of recent work up at the Society of Illustrators. The area SF/F community will be celebrating this Thursday. Come on out, bring some friends, have a few drinks, and make good conversation with great people. TOP IMAGE: For anyone at the October Art Out Loud event, note the portrait that Donato demoed. 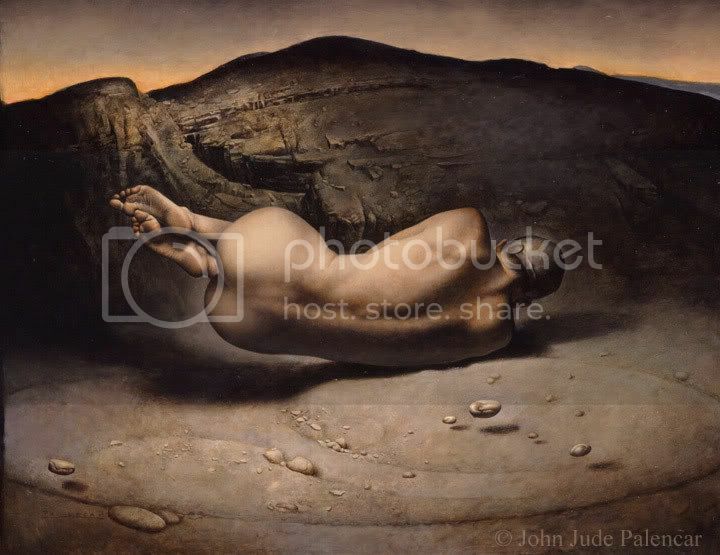 The final painting is stunning. Shelly Wan was born and raised in China. 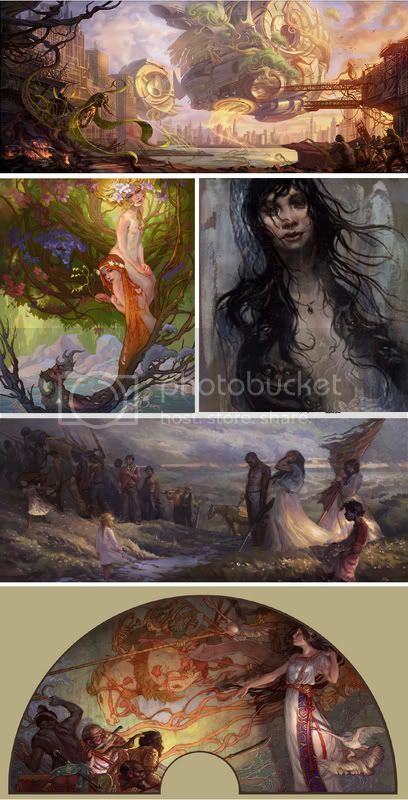 She moved to the States to attend to art school and pursue a career in concept art for movies and video games. Luckily for us, she still manages time to sneak in some illustration -- she was the winner of the latest Last Man Standing Competition and is currently working on a pirate book for Tor. 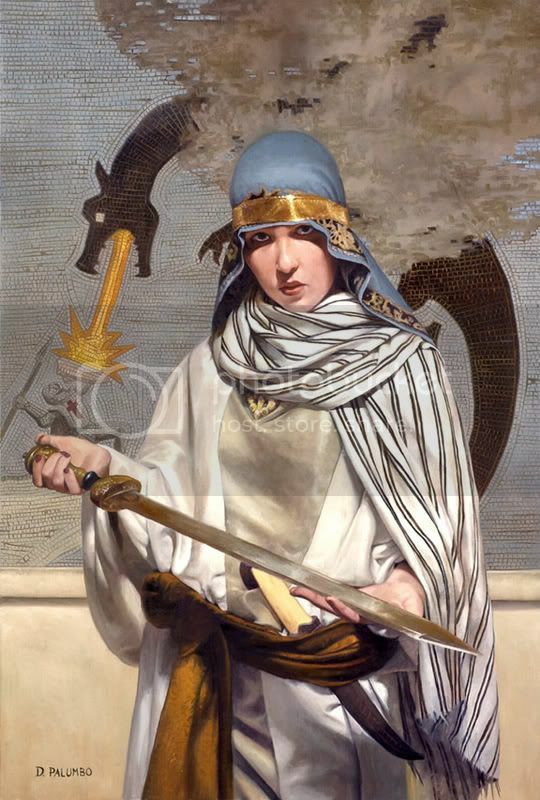 She is extremely knowledgeable of historical painters and illustrators. This strong foundation has lead her to a complex sense of design and color is remarkable for an artist just 25 years old. Mix that with her unique voice and determination and we’ll be seeing tons of great work from her in the decades ahead. I went to Pasadena Art Center College of Design from 2000 to 2004 because the school has a good reputation on educating commercial artists. I spend the first 3 year at the school concentrating on live painting/drawing skills. It was only in the last year that I concentrated on learning skills that relate specifically to film and games, and started to paint digitally. Art Center nurtured my taste with its vast library collection. It's there that I first encountered the golden age American Illustrators. In business -- because many of the teachers are working in the Industry, it offer the students a lot of insights into the field. To land a job and then to meet the expectations. i have very strong personal preferences in art, so when I encounter artistic differences in art direction of my projects is usually hard for me to wrap my head around it and change my art to fit. But as a concept artist this is almost always the case, so to be adaptable is a constant struggle on my part. I guess so. I am totally not convinced that I have establish my personal style, but I feel I am hitting it here and there, and people are responding to it. 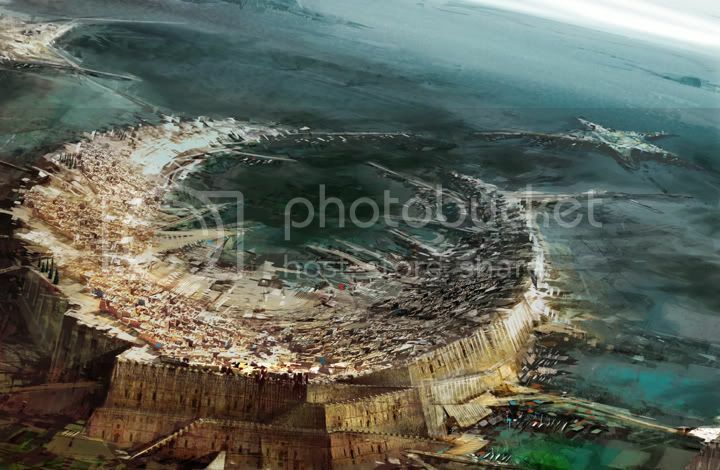 The Last Man Standing contest at ConceptArt.org definitely pushed me into the stage light, and I got some of my favorite pieces from it that's also crowd pleasers, and I am very thankful. It's a very blurry idea: I mostly concentrate my thinking on what skills I want to learn and get better at. As for where I want to be, it's probably where ever I can learn the most to aid my artistic growth and to be able to explore my own style. Any advice to students still in school? Be open to new ideas, yet be truthful to your own voice. I was continually confused by all the information that was given to me at school: rules vs. no rules, strict academy training vs. right brain thinking... at the end of the day, it's just whether you are doing art that moves yourself. Be sensitive to your instincts, and ask questions when you see pieces you like: "what's in this piece that moves me?" Distill it and make it your own. Dan Dos Santos won the Jack Gaughan Award for Best Emerging Artist. The award was given out at Boskone and I had the honor of accepting it for him. He is in excellent company -- past winners include Keith Parkinson, Donato Giancola, Brom, Terese Nielsen, Justin Sweet, Adam Rex, and many others that have gone on to great careers. Yay, Dan, you have emerged! At last, JJ has a website! Karl Schroeder had asked about some of the design decisions that went into the paperback edition of his Sun of Suns. You can see read that conversation here (scroll down for my reply) and here. Boskone was a great time. I didn’t get to as many panels as I would have liked but that’s because I was having too good a time talking to various peoples. I got to spend more time with Tor authors than I usually do. It was great to catching up with John Scalzi and Toby Buckell. I met Karl Schroeder -- who I teased with the fact that his next cover from Stephan Martiniere is nearly done. (Stephan has been taking process shots of the painting, I’m looking forward to being able to show a step-by-step here soon.) I met Matthew Jarpe and had to apologize for loosing a “t” in his name on his Radio Freefall cover. (No, it is not final and, yes, will be fixed soon!) I had the pleasure of many conversations with Lou Anders from Pyr. As for the art side of things: Gary Lippinncott’s work is always wonderful to see and get lost inside of. Dave Seeley, Ruth Sanderson, Rick Berry, Brian Dow all had great shows. It was fun to see some of Bob Eggelton’s “painting a day” pieces in the flesh. A real highlight of the exhibit was the Hubert Rogers retrospective. The Rogers family brought in a number of paintings and lots of ink work. One of the most enjoyable parts of Boskone for me each year is seeing Rick and Shelia Berry. 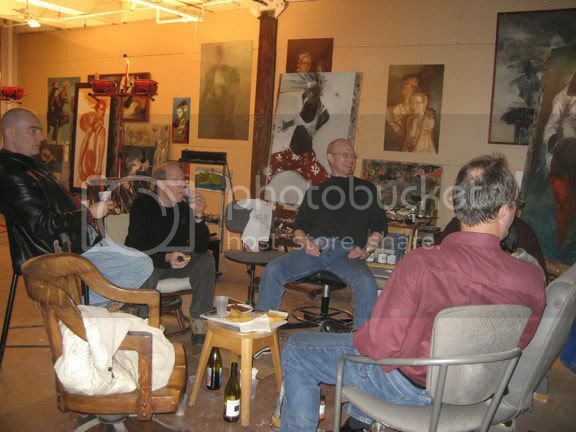 They invited a small group out to Rick’s studio Sunday night. -- a really nice and mellow way to end a con. Next convention: LunaCon. While this tends to be a fairly small convention it is chock full of artists. The guest of honor, Dave Seeley, has made an effort to be sure that that will be particularly true this year. He’s arranged for an open studio throughout Saturday. 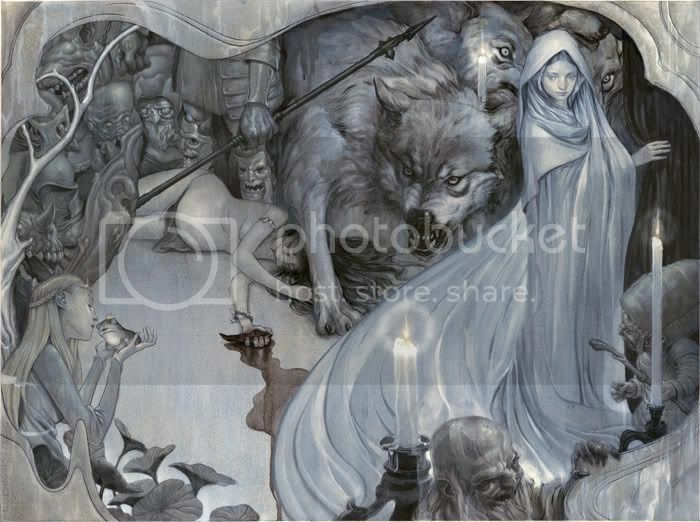 A few of the artists attending throughout the weekend, either officially or unofficially, are Donato Giancola, Jon Foster, Greg Manchess, Dave Palumbo, Dan Dos Santos, Tom Kidd, Steve Hickman and others. This will be quite the art party. Lou Anders, from Pyr Books, posts the making of a book jacket from beginning to end. Here is another re-design we are sneaking into the re-print process. I'm not sure when the next Worlds of Exile reprint will come to press but when it does, it'll look like this. 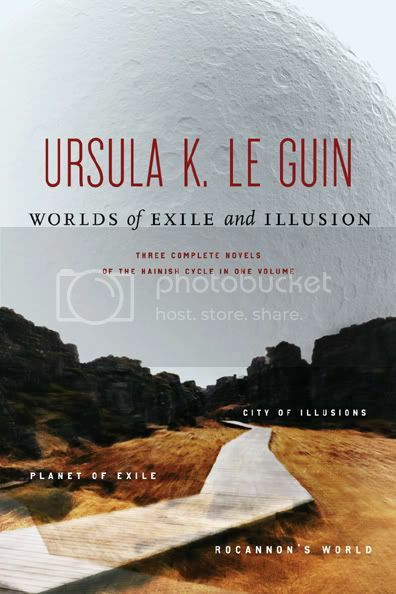 "I loved getting to work on this cover---Le Guin is one of my absolute favorite authors---but it was unusually stressful, for the same reason. The book, actually three separate novels connected just enough to work fairly well as one volume, has for me a sort of vast sense of location -- settings where the main character is in some way isolated and/or struggling to exist around the edges (or remnants) of human civilization. The photo by Eden Batki captured that tone, and helped represent the chronological and thematic relationship between the stories as well." James Jean is something of a phenomenon -- still in his twenties, and yet he has made an enormous impact on comics and illustration. Currently, James is spending more time creating personal paintings along side his illustration. It’s well worth spending lots of time at his website — the sketches and travelogues are at least as interesting as the final artworks. 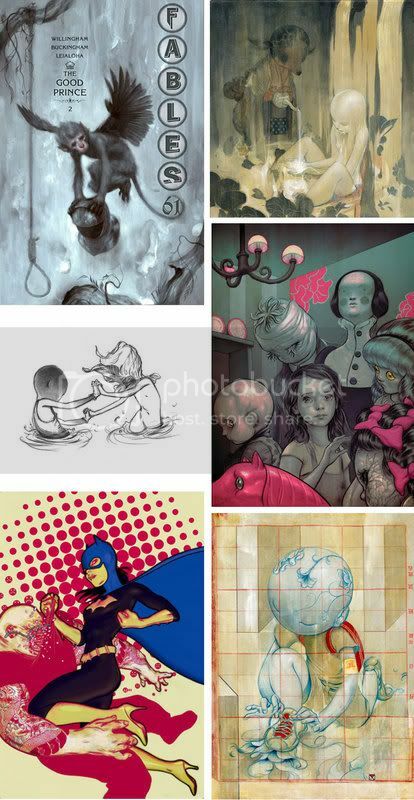 His blog, ProcessRecess has tons of great in-progress material. Also well worth checking out is his visual “conversation” with artist Kinichie Hoshine at PoliteWinter.com . Anything that allows for complete freedom, pays great, and offers wide exposure. It as during my foundation year at the School of Visual Arts. For the first time, I felt imbued with a sense of purpose and belonging. How do you feel about your college training? Art school was very important to me, a well as living in New York and forming friendships with some great artists. When Natalie Ascencios tried to fail me out of her drawing class at SVA. Honestly, every assignment I take on is a highlight until the next one comes along. Having that mindset helps keep the work fresh and interesting. My memories, dreams, and friends. Be patient with your career, don't compromise your work, and make it personal. 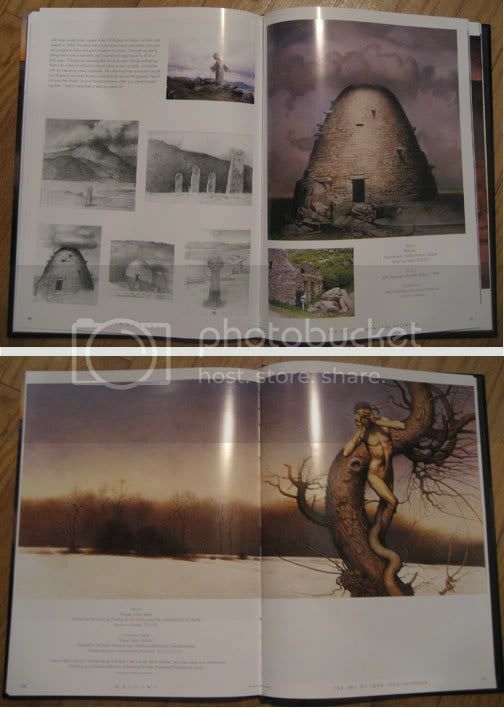 I just got a copy of John Jude Palencar's Origins and it is so very pretty -- nice full page images on practically every page and lots of sketches. Fourteen years in the business and I still get the biggest kick at seeing sketches. Somehow seeing the process enhances the magic for me, not diminishes it. I was pleasantly surprised to see a post I made here a while back quoted on the jacket: John is one of our masters in the field. He has a truly unique voice that can be haunting, ethereal, sensual, and disturbing...often at the same time. All of which can be seen in this collection of works. The book also features an extensive biography/conversation with John Jude. 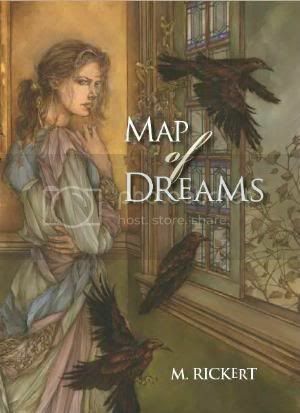 Map of Dreams (from Golden Gryphon Press) is the best book I've read since Spaceman Blues. Beautiful, subtle, haunting...and surprisingly funny in parts. I can always tell when I really like a book -- I'm about 80 pages to the end and I keep coming up with excuses not to finish it. 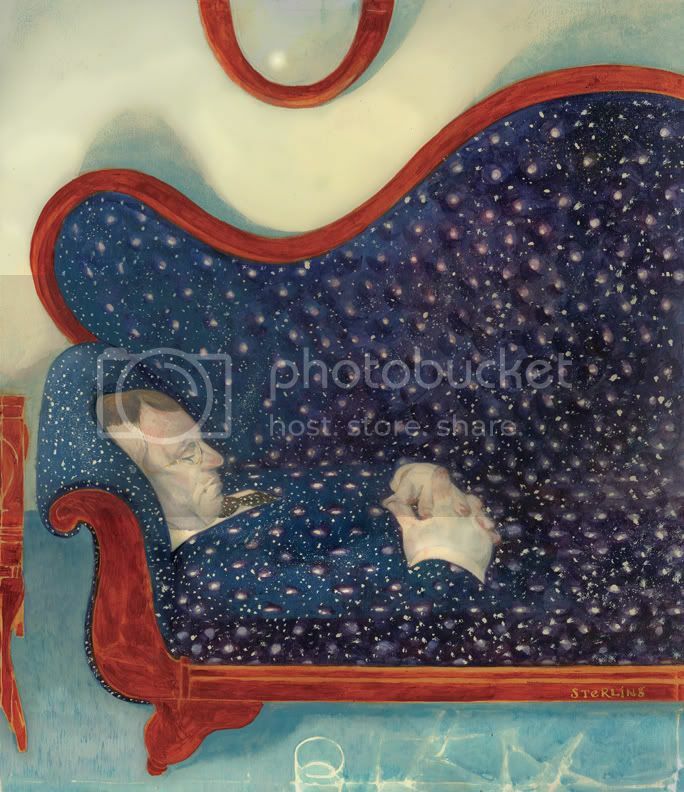 I just know that once I'm done I'll spend the next month starting half a dozen perfectly fine books and then putting them aside, complaining that they just aren't Map of Dreams. Here is a Strange Horizons interview with the author, M. Rickert. 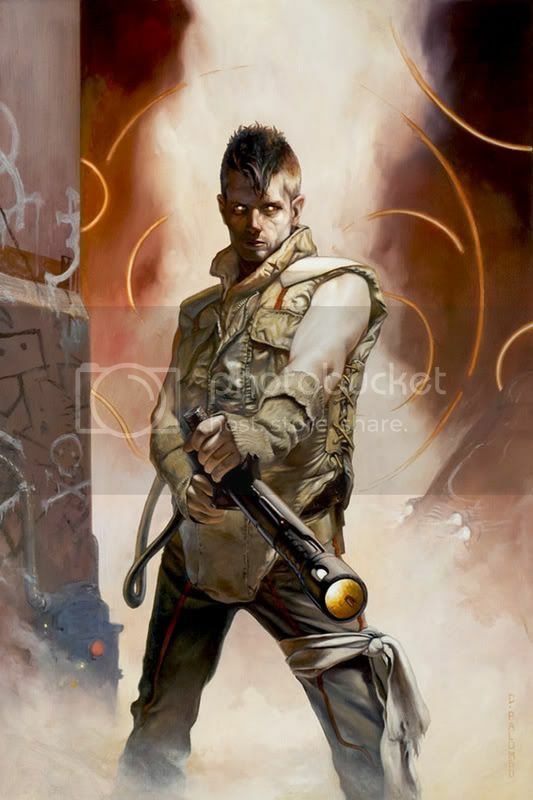 Netthermore has a comprhensive and, self-acknowledged, subjective post on sf/f covers -- the goodness and the badness of it all. A fun read. Via Lou Anders' Bowing to the Future. David Palumbo is another rising star in the field. He is one of the most dedicated and focused young artists I have ever met. He has a real love of all things science fiction and fantasy, whether it be games, books, art, comics or film. His passion for the genre comes across in every piece. David is following a twin track career path -- exhibiting gallery paintings while creating illustrations for card games, books, and CD covers. I went to the Pennsylvania Academy of Fine Arts, and before that I had studied figure drawing at a community college for a few years. PAFA didn't teach illustration, but they did have a serious approach to representational painting and working with the figure. I also took a Business of Art class in my last year which, once again, was not specifically aimed at illustration but still very useful. I wish I could take it again now. It was a small school and, by the second year, most students were fairly serious about their work, which I quite liked. What I think every artist faces: starting the job hunt cold. Working in illustration seems to me like a snowball effect, building something from nothing. The first couple years can be discouraging. What where some of your successful, or unsuccessful, early promotions? I don't think any promotion is completely unsuccessful if somebody at least sees it, though some are certainly less successful. I've had many mailings and emails go unanswered. If we're talking about early promotions, I can look back at those mailings now and see why. But now I can send the same people better work and hope for a better response. Also, networking is not really one of my strengths, though it has certainly been a help in getting work. Hmmm... It's tough competing with the veterans with connections and reliable records certainly. That's probably the hardest part, because it's something that we're immediately faced with and we'll all be running that race for the rest of our careers. I don't feel like I've had a "big" break, but I've had many small breaks come along. I tend to think of every new client I pick up as a little break, another inch on the snowball. Do you have a clear idea where you'd like to be in five years? Lets say I have a hazy idea. I guess I just want to be doing what I'm doing right now only moreso. There are certain companies whom I'd like to work with and other mini-goals I have, but they all basically translate into just building my career and improving my abilities. Don't slack off. I think that's the big one. You have to be wholly and completely committed. Most art students have heard that whole "99% of you will not making your living in art, etc." and I believe that's fairly true if you're not serious about what you do. Nobody will give it to you, you have to earn it yourself. 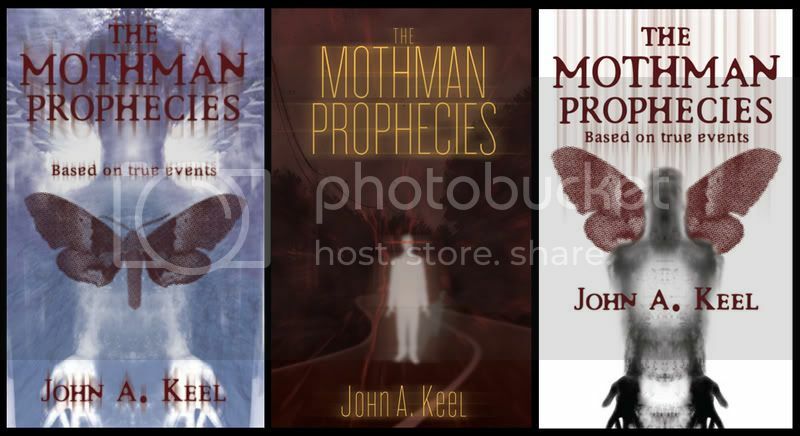 Our mass market paperback designer (and frequent Art Department commentator) Pablo Defendini did some great redesigns for The Mothman Prophecies. In the end they got nixed by Sales and Marketing -- I think they are just too harsh for a mass market audience -- but cool looking nonetheless. They have a great sense of scale about them...I can easily imagine them as gigantic posters. From Pablo: "The tone of the book is quite dark and hazy. Keel brings up more questions than he answers, lending the book a confusing and schizophrenic atmosphere. This is what I was trying to convey for the cover. I think these comps might have been a bit too subtle --or not eye-catching enough-- for a mass market edition, though." No, the troubles begin when you have "committee" designs -- when we're stuck trying to please two or three parties at once, all with a very different idea about what the book is, or should be. They are the titles that we are supposed to make look like men's adventure, romantic, self-help books, that have a touch of dark fantasy and might be suitable for older teens. We seem to publish "that" book about once a season...and it's never pretty.